There are museums of the dog, teeth museums, spy museums; museums stuffed with medieval armor or farm implements or glowing oil paintings. But there are not many museums about the economy. Abstract, complex, and mystifying, the economy defies most people’s understanding, even as it shapes their lives. The economy is what connects us, sustains us, defines our opportunities. Yet a museum of the economy would have few artifacts of its own to display – except perhaps currency. The museum, which opened to the public in September 2014, is geared towards teenagers, and its primary traffic comes from school groups. Admission is free. The new museum manages to make the economy personal, understandable, and – the real miracle – fun. The PGAV team knew they’d have to design interactive media—sounds, games, displays, video—to bring the economy’s abstractions to life. The media would have to make the economy fun as well as understandable, engaging the imaginations of school kids, jaded teens, young people full of dreams, cash-strapped parents, and retirees. And the media would have to be presented in a dynamic, intimate space that made economics feel lively, personal, and approachable. When you enter the Inside the Economy Museum, you begin in a grand, high ceilinged, historic bank lobby that predates the Great Depression. 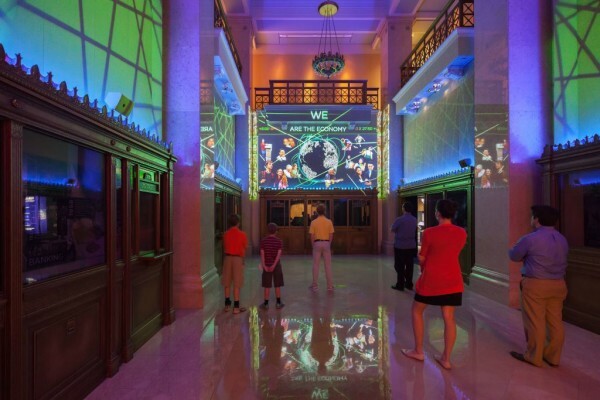 As you gaze at the ornate bronze teller windows, a multimedia show comes on overhead, transforming the carefully preserved historic space without touching its grandeur. The exhibit was designed to be a contrast to the historic building, which is celebrated and emphasized in the Intro Theater. With LED and video mapping, transitions of pattern and color, and a powerful audio track, the show introduces the idea that you – yes, even you, whether you squirrel away a precious paycheck, submit a confused tax return, endure spells of unemployment, squander your allowance, or are a responsible saver and investor – are part of the economy. When the show ends, you’re brought into a space that’s completely unexpected: dark, modern, with information streaming at you the way it does in New York’s Times Square. “From that point forward the experience is not what you would have expected,” says Owen. “You leave the lobby, the lights turn off, and you are caught by surprise.” The ceiling in the exhibit room drops lower to make it feel more intimate, and the media bring light and motion into the space. Toward that end, the team created more than 100 exhibits – enough to keep two school buses of children amused at once. Instead of the usual strip of tickertape, long and linear, the stock market display curves. Below it are saturated-color graphics about your role in the economy; how you interact with others via trade, investment, and barter; and where you’re situated in the global economy. A multi-user, interactive digital game demonstrates how the market works, swiftly and impersonally setting the price that balances what people are willing to sell something for with what they’re willing to pay to buy it. The museum even has a photo op for selfies: a giant cube of paper money that shows you what $1 million in dollar bills looks like. The deeper message is that there’s something very human behind all these numbers. And as it turns out, making economics interactive – showing them how you can play games, find metaphors, and participate – is showing them exactly how the economy already works. Jeannette Cooperman is a freelance writer based in St. Louis. She contributes frequently to St. Louis Magazine.